The General Motors Rochester Throttle Body (TBI) is OEM original equipment. Each TBI comes complete with injectors, TPS, air control valve, and new throttle body bushings. Every TBI is Flow Bench tested from high speed operation to idle. 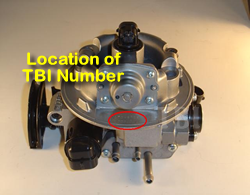 To ensure the same OEM Throttle Body Injection (TBI) for the vehicle please enter all the required information about your TBI and vehicle in the text boxes below and then click the PayPal icon to place your order. If your Throttle Body (TBI) has missing or broken injectors or core damage, please list damages in this box. We pay for you to return the old TBI core from anywhere in the continental United States. The TBI comes with a FREE UPS return shipping label. Repack your core in the box that your Throttle Body came in, adhere the UPS label, and give to any UPS driver or bring it to any UPS drop box.